One in 10 people in the world live within 'danger range' of an active volcano. There are around 1510 'active' volcanoes in the world. Volcanologists disagree on what comes under the term 'active', but 1510 volcanoes have erupted in the last 10,000 years, which means they are active in the world of volcanoes. There are thought to be many more volcanoes on the sea bed. Sometimes lightning is seen in volcanic clouds. It's not clear why this happens but it could be to do with lots of hot particles bashing into each other, causing static charges. 1. A volcano is a mountain that opens downward to a pool of molten rock below the surface of the earth. When pressure builds up, eruptions occur. 2. In an eruption, gases and rock shoot up through the opening and spill over or fill the air with lava fragments. Eruptions can cause lava flows, hot ash flows, mudslides, avalanches, falling ash and floods. 3. The danger area around a volcano covers about a 20-mile radius. 4. Fresh volcanic ash, made of pulverized rock, can be harsh, acidic, gritty, glassy and smelly. The ash can cause damage to the lungs of older people, babies and people with respiratory problems. 5. Volcanic lightning occurs mostly within the cloud of ash during an eruption, and is created by the friction of the ash rushing to the surface. Roughly 200 accounts of this lightning have been witnessed live. 6. An erupting volcano can trigger tsunamis, flash floods, earthquakes, mudflows and rockfalls. 7. More than 80% of the earth's surface is volcanic in origin. The sea floor and some mountains were formed by countless volcanic eruptions. Gaseous emissions from volcano formed the earth's atmosphere. 8. There are more than 500 active volcanoes in the world. More than half of these volcanoes are part of the "Ring of Fire," a region that encircles the Pacific Ocean. 9. Active volcanoes in the U.S. are found mainly in Hawaii, Alaska, California, Oregon and Washington, but the greatest chance of eruptions near areas where many people live is in Hawaii and Alaska. 10. 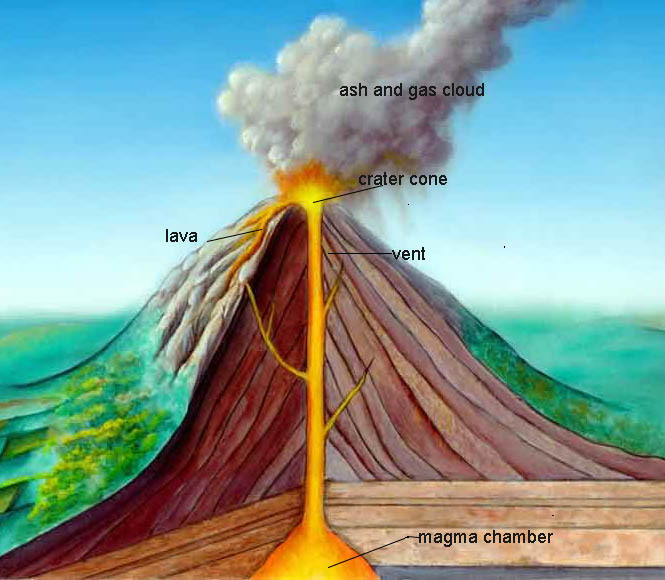 The sound of an eruption volcano can be quiet and hissing or explosive and booming. The loud cracks travel hundreds of miles and do the most damage, including hearing loss and broken glass. 11. The most deadly eruptions have occurred in Indonesia, with tens of thousands of lives lost to starvation, tsunami (as a result of the eruption), ash flows, and mudflows. Thanks to Nancy Cussary at Francisco Middle School in the San Francisco Unified School District for sharing her libguide which served as a starting point for my guide.